Going to be CRAZY busy, cookies and candy bag packing Wednesday night, Hallowe’en movies all day Thursday followed by ceremonials, then I have to get as much writing done as possible between 1-8 AM because November 1st is **NEW KITTEN DAY** for my roommate and we have to drive out into the country to pick up our 12-week-old fluffball. So yeah, using the stress! Anxiety! Angst! New Kitten Day!!! AAAAAHHH! So jealous! Wow! New kitten day? Hah! You will have your hands full! Meh…I’m ready to go. The only stress I’ve been experiencing is that I need to get the basement set up for write-ins, but my husband and others involved in the process aren’t cooperating. I did move the chairs down there though. *laugh* I know I am a pain to my spouse. My poor wife. I am so excited to see you back at it! I’ve missed NaNoToons! You rock, hon! This year my kids are doing NaNoWriMo with me…and my husband said he couldn’t just let us all do it without him trying too so we’re going to be a NaNo family. His plot freak-out is pretty crazy to watch. My teenage son is writing the script to a graphic novel and my seven year old is writing a book about our dog going to the park. 😀 I’m writing a paranormal romance (no surprise there) while my husband is writing an epic novel of comedic proportions, currently untitled (his words). LOL. That’s awesome, Dawn! I’m always so impressed with wrimos who bring the whole family in to write their own novels. My 8 year old son and 11 year old daughter are doing NaNo with me. 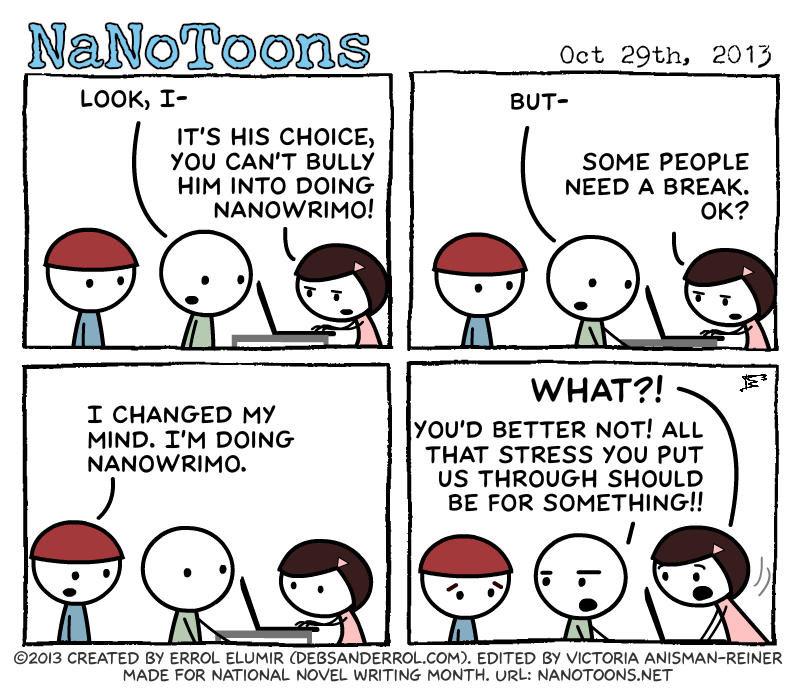 But… I’ve never done NaNo myself. We’re the blind leading the blind. What word count is your 7 year old aiming for? I don’t know how I never knew about this until today but as one who is always late to the party (so yeah, I guess I know why) let me say that I absolutely love this comic and cannot wait to reward myself with an installment after each morning’s writing session. Thanks for the smiles and laughs. I LOVED this comic. Dave telling him that he CAN’T change his mind and do NaNo now, after all the stress they put him through was hilarious! It’s got to be hard to stay away when you know so many people who are doing it. Not that I’d know… Even my most passionate recruitment got nothing. Ah well. Guess that’s what write-ins are for. But yay for Rob coming around! I’d be stressing if I weren’t so tired. Sick kid, another kid’s birthday tomorrow, stuff to do and not enough time, oh and I should really try to at least give my MC a last name. Indeed!! It is SO close! HE’S BACK HE’S BACK HE’S BACK!!! HUZZAH! I’m doing great! There is so much stuff to do, but I’m doing great! Good. Keep it up and keep with the “HUZZAH”s! You know Totoro is cheering you on as well as many others. *laugh* And you keep it up too! November is Nigh! I’m kinda with Dave on this……..after all of that stress Rob can’t just come back to Nano…..he should have to do some word penalty or something for it……..
NaNoToons is on the dashboard of the NaNo website! I don’t know how long it’s been there, or if everyone else already knew it was there, but last I checked, it wasn’t. I’m glad it’s there again, so more people can discover the awesomeness of them! Huzzah! I’m so glad! I know a lot of people that aren’t aware that they exist, and some people like them! I like the comic, but the lack of advance buttons is a bit of a pain. I’ve written buttons for webcomics before in PHP, if you want a couple of lines that are easy to adapt as necessary. HOWEVER, that is why I put Comic-Rocket on the side bar to the left. It allows for advanced buttons to easily navigate! Yay! He’s back! 😀 I’m so pumped for NaNo! I feel like I squandered my time. I need an outline. Fast. *laugh* You can do it!